This is what I purchased today. Note that no packaging has entered the house. 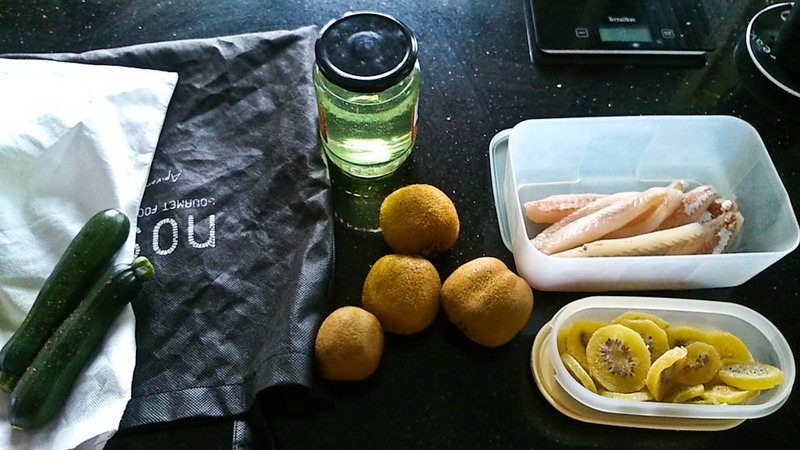 The kiwifruit and zucchini were deposited straight into the black carry bag while the fish and dried kiwifruit were put into my existing Tupperware containers, and the dish-washing liquid was poured from a large tub into the glass jar. The last two were purchased at a nearby bulk bin shop. I was lucky enough to find the only such shop in my city, Auckland about 5 minutes drive from my house. Fish shops and butchers are happy to deposit straight into your own containers as are green grocer shops. I keep one of these canvas bags permanently in my car and the other next to my handbag for when I walk to the shops. Today I took both with me in the car. Don’t you just love this zero waste shopping trip? 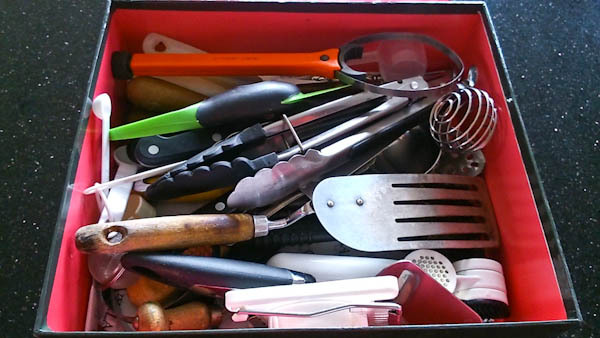 Today, I also went through my utensils drawer which was a chaotic mess – it was so difficult to find things in there (sorry, I forgot to take a before photo). I pulled out all the things we seldom or never used and put them all into a box – see the photo on the right. I have put the box in a cabinet just in case we find we need something. In which case, it will be returned to the drawer. 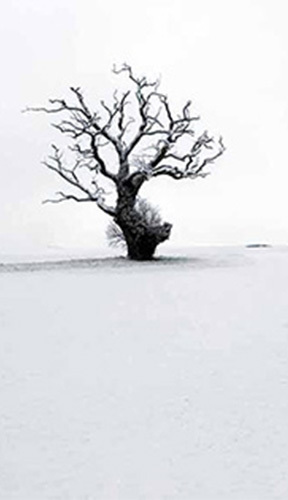 What doesn’t get returned after 3 months will be sent to the goodwill shop or discarded. 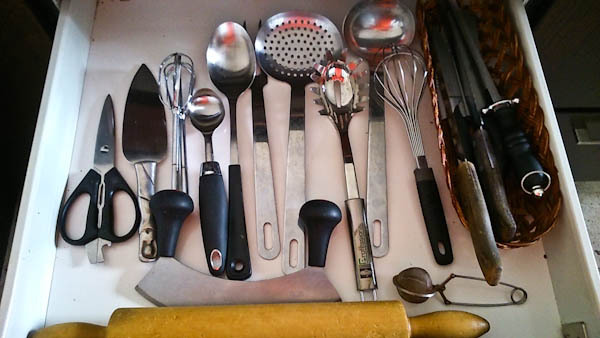 As you can see, I keep my knives in a little side basket so we don’t accidentally grab one of the sharp blades. My knife block, which used to sit on the bench, has been banished. Don’t you love how clean and tidy the drawer is now? I sure do and I can find everything at a glance. Now it’s your turn to do this. Let me know how you get on. Looks great Suzanne. I didn’t know that about fish shops/butchers and containers. Great to know. Packaging is the bane of my life. Wish the big supermarkets would do this re containers – wonder if i asked at Pak n Save, they would do it. Check it out in Pak n Save, Jane. But don’t be put off if the employee says no; ask for the manager. I do very little shopping at the supermarket now but next time I need something from the deli, I will be taking my own container. Butchers and fish shops don’t even blink at your own containers. Browns Bay is where the Bin Inn is for dry and some wet goods. When you arrive, take your containers to the counter and they write the tare weight on the bottom of them before you fill them up. I love coming home with everything I need and no packaging at all. It forces you to eat very fresh. We’ve a Bin Inn in Orewa so will check it out. Wow! Fantastic. They should be everywhere so people have the choice.